About "NKJV Spirit-Filled Life Bible Black (Red Letter Edition) (Third Edition)"
Encounter the power of the word. Walk in the freedom God intends. Experience the Holy Spirit. 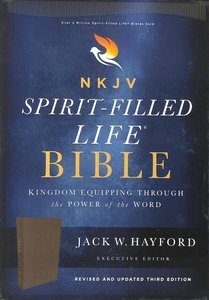 For the NKJV Spirit-Filled Life Bible, Jack Hayford, founding pastor of The Church on the Way and chancellor of The King's University, assembled a team of respected, Spirit-led scholars to produce this resource of solid biblical truth. Now in a full-color third edition with new contributors, it is even more dynamic. With over 2 million copies sold, the NKJV Spirit-Filled Life Bible continues to equip God's people to live in his kingdom, exercise gifts of the spirit, and lay hold of God's promises.